They say a zebra can't change its stripes. Almost as fundamental as stripes to a Zebra is the iconic L'ecole 41 schoolhouse label to the Walla Walla Valley original. And yet the unthinkable has indeed happened: the zebra's stripes have been changed and the transformation that we're seeing at L'ecole 41 is, at first blush, nearly as unsettling. One of Washington's most established and trusted wineries and labels is changing gears and they're doing so for reasons that are both practical and symbolic. That child-like watercolor schoolhouse image that has long become the symbol of Walla Walla's L'ecole 41 was a product of a 1984 art contest won by a third grader. Laid over top one of the chalkboards located in the school house, that image has adorned the bottles of L'ecole 41 for nearly 30 years. At the time L'ecole was looking for something to make them stand out, to get them noticed on shelves or pique the interests of new wine drinkers. Owner and winemaker Marty Clubb frames the transition as a "where we were and where we are" dynamic. "Thirty years ago we were initially a mom and pop operation. That early label became an icon adopted by the Northwest." As L'ecole has become one of the most established names in Northwest wine, they became known more for the quality wines they make and less for their "cute" label. L'ecole 41 wines can be found in all 50 states and in 20 countries. "We already made good wine with very young vines, as our vineyards age and become more established we're making incredible wines and some of the most visible in Washington state. We need a sophisticated look that attracts those who don't know us. This is a transformative time for L'ecole." Marty also pointed to the generational step that L'ecole 41 is going through, as his children are now taking a major role in the production of the wines at L'ecole 41. The new label has become a old tyme, sepia image of the schoolhouse centered on a white or black label, more on that in a moment. 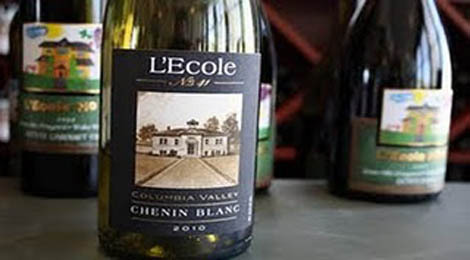 In addition to the recognition of their rightful place among Washington's most established fine wine producers, L'ecole had a practical reason to make that label change. The most common example that staff at L'ecole pointed to is their Syrah. Like many of the varietals they produce, they make two of them, a Seven Hills Estate Vineyard Walla Walla Syrah and a Columbia Valley Syrah. When people said, "Well, we'll take the Syrah; we love your Syrah," they didn't know which one they wanted - or that the winery made two Syrahs. The labels were identical aside from the tiny AVA designation. The new labels will allow people to more easily identify the wine they want. The sepia photos of the schoolhouse are framed by white labels for the Walla Walla Valley wines, and black labels for the Columbia Valley productions. When L'ecole 41 started making wines in Washington, there were fewer than 20 wineries in the state. Today, as the state surpasses 700 wineries, L'ecole's remains one of the state's finest and most consistent producers. Their iconic label has served them well for nearly 30 years, but as the industry has grown so too has L'ecole and their new label is a reflection of their maturation. Long-time fans can rest assured that the quality in the bottle remains the same. It is recommended to choose facts and statistics instead of playing with too many quotes. However, it would be good to cite someone in the introduction. Have a look at sat test scores to find more!